The Russian River offers good class II-III rapids for private rafting trips and whitewater kayaking north of the town of Cloverdale. No commercial trips are run on this 8 mile stretch. There is also ample opportunity for private float trips below the town of Healdsburg. Canoes and kayaks can be rented at various locations from Healdsburg to Jenner. No permits necessary. Be aware and respectful of private riverside property and only put-in and take-out in designated public areas. The class II-III section above Cloverdale is good for a day trip. No lodging or campsites are available along this area of the river. Below the class III run, there are opportunities to stay at a Hotel or B&B in various towns along the river such as Healdsburg, Guerneville, Duncans Mills and Jenner. Various campgrounds also dot the riverside from Healsburg to the coast if you seek a multi-day float trip. 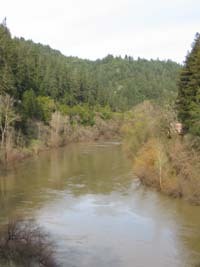 There are numerous run options on the Russian River. You can also link all the runs and make a multi-day trip. Class II-III section: There are no commercial shuttles for this run. It’s about a fifteen minute drive south on Hwy 101 to drop a vehicle at take-out. Class I:There are many kayak and canoe rental stores that also run shuttles to various locations along the Russian. 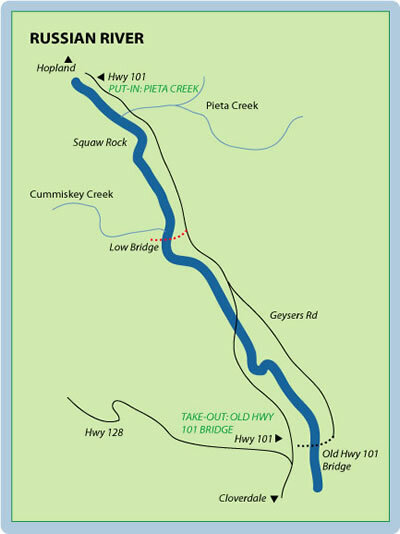 Put-in for Class II-III: 9 miles north of Cloverdale on Hwy 101 at Pieta Creek or 8 miles north of Cloverdale at the access point above Historical Landmark, Squaw Rock. Two miles south of Cummiskey Creek on Hwy 101, turn onto Geyers Road and drive south for 2.2 miles. The best area for take-out is on the left bank upstream from what remains of the old Hwy 101 bridge. This is about two miles north of Cloverdale. There are many places along the 50 mile stretch to float the river. Here are some recommended options. Healdsburg Memorial Beach – Healdsburg, Steelhead Beach – Forestville, Johnson’s Beach – Guerneville, Monte Rio Beach – Monte Rio, Duncans Mills, Willow Creek – Upstream from Jenner, Downtown Jenner – Jenner. Options include but are not limited to, Steelhead Beach – Forestville, Johnson’s Beach – Guerneville, Monte Rio Beach – Monte Rio, Duncans Mills, Willow Creek – Upstream from Jenner, Downtown Jenner – Jenner.